We managed to do a full dress run. Our costume consists of myself wearing a white robe with high heels and Juliette wearing a long dress barefoot. The reasoning behind this costume is to show different aspects of femininity and contradicting them. This is shown with wearing high heels with a robe and being barefoot with a long dress on. We started our piece just focusing on our reflections for 10 minutes and then we crushed the berries and applied them to our faces. 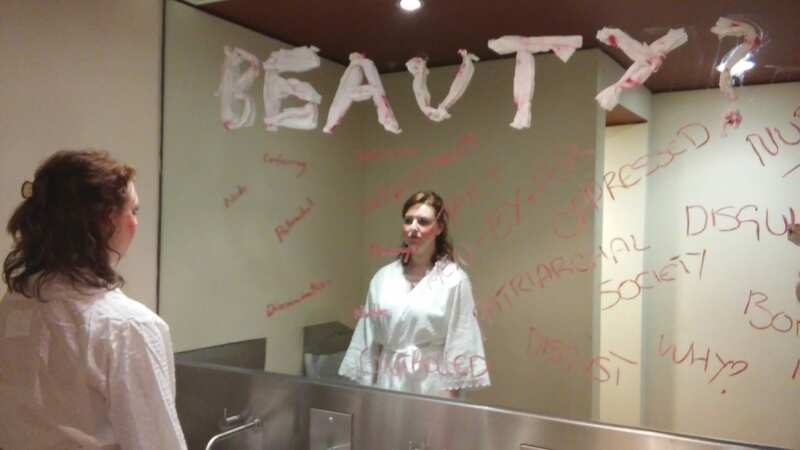 We then read our new performance text aloud still focusing on ourselves, the person who wasn’t speaking wrote on the mirror with red lipstick words such as ‘oppressed’, ‘Controlled’ and ‘Patriarchy’. We then focused on each other and applied the berries to the opposite person’s face. After reflecting back on how this went we have realized that we need to extend the performance slightly as we began to rush after applying the berries. We will focus on our reflections for some time after applying the berries before speaking the performance text as we believe it will make it look more effective. We struggled to apply the berries onto each other’s faces as it felt quite comedic and we couldn’t keep a straight face. We have decided to remove the berries off each other instead. This will link more to our performance text and will end the performance nicely.